"Oh, and have it ready by launch. :-)"
It's not uncommon for a game to start off on one console and be released on the next generation console. This usually occurs to late-cycle games but can also occur to games stuck in Development Hell. There are many reasons why this happens, the most obvious being in order to take advantage of improved hardware. Another common reason is because late-in-life titles don't usually sell that well. With many gamers making the leap to the newest console or handheld, porting or remaking a title for the next gen is the best bet for sales. In a certain way, sometimes consoles themselves can have this happen, originating as add-ons or planned features for older consoles before eventually releasing as entirely new systems. One of the last games in development for the Nintendo 64 was a Rareware title named Dinosaur Planet. It was well into development and was even late enough in development to be advertised at conventions. However, it was decided for it to be moved to the Nintendo GameCube in order to take advantage of the tech. Development was extended further when Shigeru Miyamoto noted that the game looked like it could take place in the Star Fox universe and pushed the team to rework the title into a Star Fox game. The changes included the main male Sabre being replaced with Fox, the main female (Krystal) becoming a Damsel in Distress instead of a major playable character (with her design being revamped to be Hotter and Sexier), and most of the story getting cut (what was left got dumbed down). The game ultimately came out as Star Fox Adventures. Kameo: Elements of Power has its development span across four different consoles. It was initially conceived as an Nintendo 64 title before being developed as a potential GameCube launch title. Then developer Rare was purchased by Microsoft, at which point Kameo was shifted to the Xbox and began being retooled for the more young adult-skewing demographic of the console, which ultimately pushed it to finally release on the Xbox 360. The Legend of Zelda: Ocarina of Time started out as a 64DD title tentatively called Zelda 64. The 64DD being stuck in development hell for several years resulted in the game being changed to a regular Nintendo 64 title. This meant environment elements such as grass growing naturally and player footsteps remaining in the sand got scrapped for technical reasons. An expansion called Ura Zelda was also planned for the 64DD, and while this became vaporware, it would come to inspire the Master Quest mode in the GameCube re-release and Nintendo 3DS remake of Ocarina of Time. The Legend of Zelda: Majora's Mask was planned as a 64DD Expansion Pack for Ocarina of Time called Zelda Gaiden. The failure of the Nintendo 64DD was the initial driving force to make the project a full-fledged sequel. The Legend of Zelda: Twilight Princess was originally developed on Nintendo GameCube, but development delays led to the decision to release it on the Wii as well. In North America, the Wii version actually came out almost a month earlier than the GameCube version, though other regions got both versions closer together. The Wii version mirrors the entire game left-to-right, to account for the Wii's control scheme (most of the world is right-handed, while Link is traditionally The Southpaw). The HD remake for the Wii U was based on the GameCube version, with the Hero Mode being inspired by the Wii version. 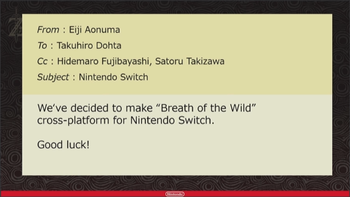 The Legend of Zelda: Breath of the Wild: Originally developed for the Wii U, it ended up not being finished until Nintendo was ready to release their next console, the Nintendo Switch, which prompted Nintendo to make it a dual release on both systems. Metroid Prime 3: Corruption was originally going to be released on the GameCube, but development was later shifted to the Wii. Cubivore started out as a late Nintendo 64 title but was moved to the Gamecube. The Last Guardian was announced at E3 2009 for the PlayStation 3 but didn't end up coming out until 7 years later on the PlayStation 4. Nioh was announced even earlier at E3 2005 during the same press conference where the PS3 itself was revealed. The game wasn't released until 2017. ICO started life as a PS1 title, but got ported to PS2 midway. One artifact of that is the game running in 240p mode, needlessly upscaled to 480i (or 288p to 576i for the PAL release). Eternal Darkness started off as an N64 title, but spent many years in Development Hell before finally being launched on the Nintendo GameCube after Nintendo intervened and course corrected its development. Resident Evil 0 had its development shifted to the GameCube, both because of the N64's low install base and to put its graphics on par with the remake of Resident Evil 1. The most infamous example was the PlayStation and the SNES CD-ROM. The PlayStation originated as an CD-based add-on for the Super Nintendo Entertainment System that was a joint effort between Nintendo and Sony. However, Nintendo abruptly called off the deal when they discovered terms in the agreement that weren't to their liking, which prompted Sony to release the PlayStation as a stand-alone console in retaliation, to great success. As supported by the number of GameCube games that ended up as Wii games, there's evidencenote Mostly in the form of leaked demo builds of games such as Metroid Prime 3, a patent Nintendo submitted, and a leaked prototype for the Wii Remote that plugs into the GameCube's controller port that the Wii itself started development as an add on for the GameCube that provided its signature feature of motion controls as well as slightly increased power. This idea was likely abandoned due to the shaky historical performance of console add-ons as well as the GameCube's limited install base making it a better strategy for Nintendo to release a whole new console. The internal hardware of the Wii also reflects this, given how it's basically an overclocked GameCube with extra memory. Pokémon Snap started out as a Nintendo 64DD game, but likely many similar projects, became a standard Nintendo 64 game after the failure of the peripheral. A Kirby title for the GameCube tentatively titled Kirby Adventure was worked on for years but ultimately shelved, with some of its elements reworked into the Wii's Kirby's Return to Dream Land. Kirby 64: The Crystal Shards started out as a 64DD title before being moved to cartridge. Sonic Adventure started out life on the Sega Saturn using the "Sonic World" engine from Sonic Jam. Early in development, it was moved to the then-upcoming Sega Dreamcast. A Wii U version of Yooka-Laylee was planned, but cancelled when development moved towards the Nintendo Switch. Donkey Kong 64 was planned as a Nintendo 64DD title instead of a Nintendo 64 title. Banjo-Kazooie went through this along with a Mid-Development Genre Shift. The developers originally intended it to be an RPG-adventure title for the Super Nintendo Entertainment System before deciding to turn it into a 3D platformer for the Nintendo 64. According to a Super Mario Galaxy preview on G4 (circa 2006), it was initially going to be a Nintendo GameCube game (this was in turn one of the remnants of the cancelled Super Mario 128 project). The first The Legendary Starfy title started development in 1995 for the Game Boy. It was moved to the Game Boy Color before finally being released as a Game Boy Advance title in 2002. Kirby Air Ride for the GameCube started life as an early Nintendo 64 title called Kirby's Air Ride. The original incarnation was cancelled but ended up later being revived. Donkey Kong Barrel Blast was meant to be released on the GameCube, using the DK Bongos made for Donkey Konga. It then became a Wii title, using motion controls instead of the bongos. EarthBound 64 (Mother 3 in Japan) started out as a Nintendo 64 title but it had a Troubled Production due to the creator's inexperience with 3D. Years later it came out as the sprite-based (and Japanese only) MOTHER 3 for the Game Boy Advance. Shenmue was originally made under Sega Saturn during the last years of this console, but due to limitations of the system and the upcoming arrival of the then-next console Sega Dreamcast, developers decided to move the game to that new platform. Actually there're plenty of images when the game was in development , as well some videos . Also, there's a strong rumour about a Saturn ISO with the beta on the internet and some few people that claims they have this beta, but nothing confirmed until now. Super Paper Mario was originally designed for the Nintendo GameCube, but it was changed over to the Wii during development. A dual-platform release was considered at one point. Final Fantasy XV was announced in 2006 as Final Fantasy Versus XIII for the PlayStation 3, a spin-off of the then-still-upcoming Final Fantasy XIII. After a decade of Schedule Slip, the connection to Final Fantasy XIII was dropped and it was it Retooled into being the next major installment of the franchise, Final Fantasy XV, and ultimately released for the PlayStation 4 and Xbox One. When it was first announced, Persona 5 was intended to come out in 2014 for the PlayStation 3, which would have been a year after the launch of the PlayStation 4, but not an unreasonable time for a PS3 release. After Schedule Slip occurred and the game was pushed into 2016 (in Japan; 2017 for overseas release), it was decided to release it on the PS4 as well since by that time the next generation was well underway, and Sony was in fact discontinuing production of the PS3 during that time as well. Atlus originally planned Persona 4 Golden as a PSP demake similar to what they did with Persona 3 Portable. However, when the Play Station Vita was announced, they chose to release it on that system instead since that would allow them to produce a Polished Port. The original Shadow Hearts was originally planned for the PlayStation, like its predecessor Koudelka. Development shifted to the PlayStation 2 for the final release. Tomato Adventure was originally titled Gimmick Land and intended for the Game Boy Color. Developer AlphaDream moved it to the Game Boy Advance and changed its name when that console got released. Nintendogs was conceived as a Nintendo GameCube title however it was moved to the Nintendo DS to take advantage of its touch-screen. Animal Crossing 2 (unrelated to the Japanese-exclusive e+) for the GameCube was scrapped early in development. Aspects from it were included in the Nintendo DS' installment Wild World. A Wii U port of Stardew Valley was scrapped in order for it to instead appear on the Nintendo Switch.